The Serbian President, Aleksandar Vučić, has said he is hopeful that Air Serbia will post a profit for the previous year but conceded he has no precise data. "I hope they have turned a profit even though it is very difficult. People should be aware of this. If you exclude the transatlantic operation, I am certain Air Serbia is profitable. Even with the long haul service I hope they are in the black, which is terrifyingly difficult", he said. Responding to questions at a press conference, the President added, "I won't remind you how Montenegro Airlines, Croatia Airlines and others are performing. It is very difficult. I don't currently have precise information but since you [media] are insisting on this topic, I will personally prepare for a future press conference". Air Serbia is yet to publish its financial results for 2017. The airline posted a profit for three consecutive years in 2014, 2015 and 2016. In 2014, the carrier's net profit stood at 2.7 million euros, which was followed by a 3.7 million euro profit in 2015. In 2016, upon launching its first long haul service, the airline's figures declined 77% with Air Serbia managing a 990.000 euro profit. However, such results are unlikely to have been achieved without the financial support provided by the government. Commenting on Air Serbia's flagship route to New York and the sustainability of the service back in April, the Serbian President noted, "Can you make money on flights to New York? Of course you can't. We will be able to do that in about a year or two when three to five years have passed since the route's launch. However, these flights are important for the country's and airline's branding and image". Croatia Airlines and Montenegro Airlines are the only two carriers in the former Yugoslavia to have so far published their financial results for 2017. The Croatian carrier registered a record net profit of 3.6 million euros on the back of selling its five weekly slot pairs at London's Heathrow Airport, while Montenegro Airlines posted a net loss of 4.6 million euros, its smallest in five years. Adria Airways is yet to publish its figures for the previous year. 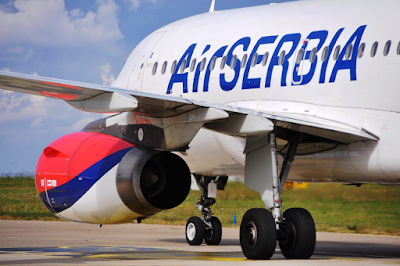 Air Serbia has undergone wide-ranging restructuring in an attempt to boost its key performance indicators, as it struggles to keep a lid on costs, growing competition, an over-inflated workforce and the winding down of state subsidies. The airline has taken steps towards restructuring its business by reducing its workforce in late 2017, transforming into a hybrid carrier, consolidating its destination network, putting on sale non-airworthy general aviation aircraft and retiring some of its ageing Boeing jets. The company's interim CEO, Duncan Naysmith, told employees in an internal memo in February that focus will be put on "net profit, the new fare structure, in-flight sales, additional services that bring in ancillary revenues, as well as other initiatives to boost efficiency". So he has basically admitted that the reason the company is in this state is because of JFK? Yep. As usual all those people who for years were staying that this route is a financial suicide were proven right. Despite being labelled haters by company/party trolls. And the cheerleaders were again proven wrong. Let's all hope that now that even their dear leader admitted the truth of JFK being launched for prestige perpuses they will be able to admit it too. So what? Launching flights to New York and leasing a widebody will certainly put a strain on finances. Some aviation expert you are if you think that doesn't affect your finances. It also takes time for many routes to become profitable and they are rarely an instant money makers. They probably would have done this restructuring with or without New York. Let's launch a few more prestige routes, to increase the future profits!!! New York is just one of a wider range of issues in the company. This outcome is a result of incompetent management who were promoted by Etihad and the Serbian government as people with "know how". Yes, I believe the whole operation is failing to turn a profit. The JFK adventure just made matters worse and exposed the ugly truth about the ASL business model. No, let's get here and treat frustration. Life will be than perfect. Interestingly the loads for JFK are extremely good. The problem is it is loooots of transfers who pay cheap tickets to fly on this route. JFK is not loss-making the whole year. Everyone knows it takes time for a product to mature. The issue here is that JU launched these flights way too early. Couldn't agree more @anonymous 9,19am. Air Serbia's intial full service approach was clearly Etihad's poor understanding of the European and Serbian market, and that still continues on with this restructuring into an over prices hybrid airline, unfortunately. You are absolutely right! Poorly managed company from the begining. JFK is the most prestigious route in the Balkans! Bravo JU!!! Yes, today while I was saving my face I felt strong national pride when I remembered that JU flies to JFK! I find it difficult to see how they will publish a profit for 2017, even with the most creative of accounting. I'm sure they'll manage. They can get a few tips from OU. You obviously don't go into such restructuring a business model change if your finances were performing well. Didn't the subsidies end last year? Formally they ended. But we all know that if money is needed for president's PR projects, money will always be there. In the most creative ways, if necessary. You can call it whatever way you want, but at the end it is subsidy. In 2017 they received 14 million EUR from Serbian Development Fund. Now this is much less than 40 million EUR they received in 2016 but they still received some money. Interesting. Let's see the bottom line to understand the true performance. El Presidente is softening the public, managing the expectations. If I'm not mistaken average oil price was higher in 2017, compared to 2016. And 2018 will be even more difficult. Unless JU hedged oil at low price, 2017 may be more challenging. Maybe improved financials had to do with the cuts of the loss-making routes. Cuts may bring short term relief, however the impact of reduced network may take a bit longer to manifest, but will definitely limit JU's long-term revenue generating capacity. Did the government give any money in 2017? And last week he said how they will publish a profit!!! This guy changes his story day by day. No it isn't. He gave this statement on Monday. But on the Monday before he said how Air Serbia is profitable. Two different press conferences a week apart. And they plan on starting Toronto because that will boost finances??? LAX, SFO and SIN as well. Even more potential for "profits" for ASL!!! The sandwich eaters found the solution again. Yet when people propose LAX and SIN to ZAG no one says anything. Who ever said that OU would fly anywhere across the ocean? Nobody had anything against Hainan starting Beijing. Their risk. We would if JU went for the same route. Who are "we" you are claiming to represent? If you are not on the JU Board, you are nobody. Completely logical since they launched NYC. Yesterday was a first, JU operated a charter to CAG onboard the A320. I have never seen more people praying for a company to fail and go bankrupt then I have seen for Air Serbia. What's the deal? They have fittingly retired that slogan. Now it's "New possibilities". Luckily they have also dropped the living legends nonsense. People are bitter and hate on everything. They also fail to see a wider picture of anything, including NYC flights. People are commenting poorly managing of the company and you call that "praying for it to go belly up"? People who finance your boss's prestige project with their OWN MONEY have every right to criticize it. You don't like criticism? Move to Iran or Russia. He certainly isn't my boss neither am his supporter. That does not mean I'm praying for the company to crash and burn like many people here for various reasons. And the majority of people who criticise certainly are not tax payers in this country. To nije njihov novac, uglavnom ne placaju porez, zive kod tate i mame i voze se sa LCC kompanijama i tako to. Srpski prosek. Komentare takvih negativo-prosecnika ne treba analizirati. U zivotu ih odrzava pljuvanje i mozgovanje o svemu, dok sede i pijuckaju kafu ceo dan u kaficu. Ja nisam srpski prosek i veoma sam kritican prema tome sto bacamo nase poreske pare na JU sa kojim inace cesto letim. Nisam ni ja srpski prosek i bas me briga sta ti mislis kako treba trositi poreske pare u avijaciji. Tvoje misljenje je nebitno. Vec si pokazao potpuno neznanje o avijaciji. Samo zato sto mozda placas porez i koristis zdrastvene usluge ne daje ti apsolutno nikakvo pravo da odlucujes kakve bolnice treba da budu i kako opremljene operacione sale treba da budu i kako hirurzi treba da rade. When will we be able to read the entire financial report? It will be published by the business registry. Probably in August. how big are the chances of etihad pulling out of air serbia? According to the president they will likely extend the deal. We will know officially by the end of the month. alright. just want to say that serbs are lucky becasuse of such big airline controls them. montenegro, croatia and adria can only dream about having a330. That same A330 is pulling them down. That is your narrow, short-term view. Sometimes you have to analyse the bigger picture. Even bigger picture - expanded transatlantic long haul brings more feed traffic to regional lines and in the longer run makes all of it profitable. Ask Lufthansa to stop relying on its feed to MUC/FRA + long haul if you are so confident this combo is making losses. If LH continues we'll know you failed. he admitted he is not up to date with JU financials, so he promised reporters he will get prepared for the next press conf. i can imagine the chaos in JU financials at the moment, trying all kinds of somersaults to paint a good picture. my guess he will will mostly rely on good money they've got from vinci, tourism development, wider reach of aviation industry (supported by that oxford economic nonsense they always mention), and of course that JAT was dreadful. wonder if he will announce coming of neos? Any extra money they got from Vinci is a wash at best, given ~250 million euros gov't threw at JU. If you incorporate time value of money since subsidies were front loaded, using government's borrowing costs it's most likely a negative NPV. WHY is anyone comparing the tree airlines in termos of their absolute prifit? Makes no sense. What is most important is the PROFIT MARGIN, which is always used. Look at the ration turnover to profit. "I won't remind you how Montenegro Airlines, Croatia Airlines and others are performing." Bravo Vucicu, tako se govori, to je najvažnije! Tako funkcioniše ex-YU politika već 30 godina. Bravo Vucicu!! naravno da je relevantno kako drugi u regionu rade. May I remind you that Kucko has been using that type of lingo intensely over the past period - "mine is more cultured and bigger than yours always". Balkansko prepucavanje. When did Kucko say anything like how you described Anon 1:43 PM? All Kucko ever said about Air Serbia is that he doesn't believe they are threat to OU and on that he was actually right! Zašto Vučić gotovo uvijek sve u Srbiji uspoređuje sa Hrvatskom? They received around 162 million EUR in state support between 2013-2016. Smallest support was definitely in 2017 and in 2018 they received nothing. At 5% cost of capital this is ~eur 220m in 2017 euros. Plus airport fees were so low, that the true subsidy is much more than the airport bill. And then you compare this to $5M that Wizz was supported with over 5 years in SKP in to base 4 aircraft и падне ти мука. Anon 10:23 AM: Every airport will offer discounts to their largest customers. They are not subsidies. The INI scenario is giving everyone large discounts, not just to one airline. Radujem se uspehu AS i nadam se da ce postati profitabilna do 2025. kada se ocekuje ulazak Srbije u EU. Zahvaljujuci AS Srbija ce za koncesiju dobiti pola mil. evra sto je visestruko od ulozenog u As, a da ne spominjem kolko je drzava dobila benefita od zaposlenih u AS i kompanijama koje indirektno saradjuju sa njima,turizma i jos mnogo toga. Vrhunska usluga,mderni avioni,internet na letu,let za JFK,redovnost polazaka,minimalna kasnjenja. U poredjenju sa Jatom i ostalim kompanijama u regionu USPESNO,zar ne? Za sve to je potreban profit. I dosadni se više sa usporedbama JAT-a i JU. Ako u nesto ne ulozis,nece biti ni profita. Nego, koliko vam još para treba, pa da skupimo? frishki@ Pa i vi se radujete "profitu" OU a svi znamo kako je profitabilna, prodaj ovo, prodaj ono...pokaži plus na kraju godine i to je to. Šta će biti kada se sve rasproda? Pustite čoveka neka se raduje. Ja smatram da se mora uložiti u JU da bi uopšte postojala mogućnost da postane nešto jača komanija. Ma tko se raduje "profitu" OU? Isti takvi botovi kao ovi vaši. I čemu da se raduje? Slici koja se šalje u javnost, a ispod koje - trulež. OU ili JU - isti BS. Vjerojatno ste plaćeni po stranačkom postu, pa onda ima smisla. Ajd' neka kad u JU teku med i mlijeko. Ma ne kazem ja da teku med i mleko samo smatram da treba uloziti da bi ti se vratilo. Kako su Luftahanza<britis i ostali postali profitabilni? Sipano je u njih milijarde evra pa kad su postali to sto jesu,subvencije vise nisu dozvoljene vec moramo da poslujemo trzisno. NIJE NEGO. Da ne otvaramo sad tu temu,jer vlada zakon jaceg i to je to. Do kada biste "ulagali", odnosno ulupavali pare? Ni jedna država sa ovih prostora nije niti Velika Britanija, niti Francuska, niti si može priuštiti takve egzibicije. Uostalom, postoje pravila unutar EU kada su u pitanju subvencije. Tako je al pravila su uspostavljena tek posto su milijarde sipane u njihove kompanije. Ja ne kazem da AS moze da postane British i da leti sirom sveta,vec tamo gde ima Srpske dijasporeI pritom pokupi transverne putnke iz okolnih zemalja kolko moze i to je to. Mislim da je svakome ko eti za JFK bilo da je Slovenac,Hrvat,Bosanac ili Albanac bolje da leti sa AS i da se oseca kako gospoda nego da leti preko Frankfurta,Amsterdama ili Londona,gde kad vide odakle dolazis gledaju te ispod oka i tretiraju kao gradjane drugog ili treceg reda.Ponizavajuce. E, sad si ga opalio i ostao živ. Air Serbia je world class kompanija koja tretira putnike kao gospodu, a sve ostale kao stoku. Na trenutak sam pomislio da možda i nisi fanboy, ali ovime si odagnao svaku sumnju u suprotno. Znas i sam u kakvim su odnosima Srbi i Albanci zbog Kosova i metohije u poslednjih 100 godina pa je avion za JFK pun Albanaca,to ti je naj bolji odgovor. Aj zdravo moram da idem da zaradim dnevnicu:) za razliku od nekih kojima je posao da kuckaju po celi dan ja moram debelo da je zaradim. That's because it was a last minute swap due to an Atr shortage. Real load was 56/66 as that was the configuration that was used during the sales period. Mozda je u odlasku bila velika potraznja? Alen knows this all too well, but he will not miss a chance to score an easy point with the audience that is so hungry for bad news. Indeed, Purger, what is your point? Није, то је непланирана замена ваздухоплова јер се вероватно неки од Атр-ова покварио. То је редовна пракса у таквим ситуацијама. На крају крајева, Ер Србија није изгубила паре на том лету иако је попуњеност била свега 38%. That's actually a great load! It means that the Atr was full! GO JU! The flight was not operated by the Airbus but by YU-ANK a B733. Costs on these birds are extremely low as there are no leases so overall costs are much, much lower. @10:06 - This is very creative - instead of calculating LF on the real equipment you calculate LF on "sales period" equipment. By using your logic all airlines could during "sales period" sale the smallest a/c, fly with something else and LF would be all the time greater then 100%. How the others haven't found out that logic? What if todays number were 67/66, how would you explain LF of 101%? By addding another seat in the cabin ? What if 68/66? Two additional seats ? ???? Why you attacking Purger? What he wrote wrong? all i wanted to say is that if operating a half-empty Boeing cost the same as operating a full Atr for that short flight then everything is fine. You seem to be lacking the understanding of how the airline business functions, and in particular Revenue Management. One parameter in RM is the capacity on which the forcasts and therefore sales are done. If the larger plane was planned in the system long ago, the availability of the lower fare classes would have been there resulting in more sales. OPS can always change a type, which is pretty normal in cases of technicals. The flown LF is of course calculated on the AC flown, but since it was changed on short notice, the sales load was pretty good- calculated load factor of course bad. The same vice verca where a bigger plane is used and changed to a smaller. @Alen: Everyday occurrence around the world! In both directions! Despite your vulgar tone I will reply to you. A LF of 38% is not realistic because during the sales period there were no 144 seats on offer but 66 as the Atr was scheduled to operate the flight. Also, as the Atr was filling up fares kept on climbing. Had they planned to operate the flight with the 733 there would be more passengers as there would have been far more lower fares on the market. It's quite simple. You can use JU's SKP flight as an example where we have a mix of A319 and Atr. This is a last minute swap which are quite common. I remember once I was supposed to fly on a LH A319 but due to a technical issue the plane was changed to an A300-600. There was no way for it to be full because its configuration was never available in the reservation systems. Realistically speaking, Lufthansa looked at the success of the flight based on the configuration that was planned. As for your question why other airlines have not thought of it, well, the answer is quite simple. Primary concern of all airlines is to secure good yields. There is no point in having a high LF if you are losing money. @11:28 - thanks, we agreed that that LF is calculated on real a/c. That was my comment. Forecast, revenue, margin and all other busienss parameters used in sales process are very well know to me, as I am daily using the numbers. Purger omitted that it was a last minute change so it was misleading. Despite that you are upset and unhappy with my post I will reply to you, again. There are number of indicators that companies are using to keep track of their business. LF is one of them. You wrote about it. You didn't wrote about revenue, yield, costs etc., and my intention was to point out that LF has never been calculated around the globe in the way you wrote. You missed the whole point of my first post but nevermind. Air Serbia installed self check in kiosks at Belgrade airport. Are they functional now? Can we check in using only kiosk? Yes you can. I was at the airport a few days ago and people were using them. Fantastic! Kiosks and credit card payments for BoB were the last two additions that make Air Serbia experience world class. Most passengers I talked to are really enjoying Air Serbia experience now, unlike some weirdos here. Decko usluga prodaje u avionu AS je sve samo ne world class. Nemaju ni kusur u sitnim apoenima evra. Tako da ne znam sa kim si ti razgovarao. I flew with several airlines that have by on board service and all of them have issues with the change. That is not only JU speciality at all. "to je tvoj problem jer nisi world class putnik. " Ljubomorni komšija, kad nema argumenata onda mržnja. Diskusija bi bila civilizovana bez vas. Naravno da se svuda dogadja zato se polako prelazi na cashless placanje. Oni koji ne znaju da se to svuda dogadja zato vredjaju druge sendvicima kao da smo mi botovi. Another factor which helped JU is that Dinar got stronger compared to the Euro. Last year at this time €1 was 124 while now it's €1-118.1. If the NBS did not intervene a few times it would be 117.6 by now. I'm very proud that JU made it through the storm. The best is yet to come. Proud that JFK is still served without turning seasonal. Proud that Heathrow is still flown. Proud that punctuality is at its best and the regional hub being transformed from dream to reality. Keep up JU! God bless your nearly 100 year history that no other airline in the region managed. Hip hip hurray! Are you referring to the BoB service? Frishki kakav bedni odgovor. Kada ti budes slavio OU uspehe tebe treba pitati da li ti je Kolinda dala sendvic zbog toga. Za razliku od tvojih drugara, ja nikad nisam slavio ničije "uspjehe", pogotovo ne od OU. Da znas da citas video bi da je istina. Tacno je da JFK i LHR lete i da je hub operativno sve tacniji. Ako neko napise istinu odmah "sendvici za sve"? Da li nudis sendvice za sve ako neko napise lose vesti o JU? Da znas citati znao bi da je Air Serbia i uspesna i posluje pozitivno. I onda je svizac zamotao čokoladu u omot. Frishki, still 90 years is 90 years, amigo. At least JU still didn't sell its slots, if you know what I mean. O nije sve super, dapače! Da je super, Air Serbia bum imala 3 dreamlinera, još 10 narrowbodyja i 20 novih destinacija. Tak sam tužan zbog toga, ali možebitno će imati novoga Airbusa A330 do listopada. JU u najboljem slučaju postoji od 1947 u kontinuitetu. I AlItalia ima sve navedene karakteristike pa je u bankrotu. Sve relevantne insitucije i liste smatraju da je Air Serbia 90 godina stara, ti samo pokusavas da falsifikujes istoriju. Da nisi ti iza pokusaja da JU367 falsifikujes kao obaranje od strane Cehoslovacke? Smenjen direktor Niskog Aerodroma. Radi Zorica. I think that unless the A330 "fleet" does not grow to at least another extra aircaft and extends to two more destinations (YYZ and ORD) the A330 is going to be loss making. We have seen now LOT to start flying from BUD and Tarom seriously plans long haul flights for next year. Same time AC Rouge touched down in ZAG and this not the end of line. So ASL can gain new customers only via the fare. Folks from OTP for instance can only be lured to fly vie BEG if ASL is cheaper then RO and the comptetitors. No one will fly ASL just because the product is so overwhelming. This means fares are going down and so are profits. I think that Vucic once mentioned that the ASL JFK -route is important for trade, cargo, tourism and the image of the country. I think that this a very honest remark. It's ok unless the route does not drag down the whole company to sink! I think that every major airline has one or even a couple of political routes. But they have at least enough other routes to cross-subsidize the losses. And people fly on LO or OS because of their service? Yeah, sure. I did not say that. For sure OS and LO compete also fare-wise. However if there is a direct route you have to go down with fares to attract people to spent 2,3,4 or more hours of detour. So if RO offers let's say a 750€ fare OTP-JFK and ASL 720€, what do you think people will choose? And never forget every feeder flight vie BEG is always 4 segment fare, meaning that you need to break down the income on 4 segments instead of 2. That's why LO, OS and others do better because they have much more Business Class and higher fares on the O/D sector then ASL. And sure it helps if you can earn miles with them, because they belong to a large airline family like Star Alliance and similar. Got it? That's why it is important for ASL to attract more people to fly JFK-BEG-JFK or v.v. instead of cheap feed from OTP, ATH, SOF etc. ASL is simply a fish that's too small in that pond.....I still believe that ASL has to change philosophy and completely abandon the mini-hub strategy and fortify it's niche as the national carrier with more destinations and more direct flights (e.g. MAD, BCN, OSL, DUB, IEV, CAI etc.) and compete against Wizz instead being the 7th or 8th feeder carrier on the route from Tirana to Stockholm. It's irrational that Albanians, Bulgarians, Greeks etc. profit from heavily subsidized flights instead of offering more convenient flights for Serbians, business people and tourists on direct routes. Tarom has been speaking of launching long-haul for years and years now. They won't do it as they can't afford it. Anyone know which are the most profitable airports in ex-YU? People should underestand once and for all. Having a national airlie is not about profit and passengers, yields and all the fancy numbers. It is about pride and showing off to your EU neighbors. Hearing an engine of your national airlie jet taking of above you flying your national airlie colors make you feel the same shiver as listening to your national anthem. So we all should help to keep our national airlie flying high in the years to come. Or alternatively fly from Skopje and Sofia and be a traitor of motherland. R u talking about Tarom, Montenegro or Croatia here? LOL dude, I hope you are trolling! Luckily no one is asking you. Some people like the old Jat egg shape, some prefer Air Serbia symbol, but almost no one liked the dots. The dots are the best. I really miss the old JAT logo. The current JU is just quite standard. Current JU looks like a product from third world country were politicians still consider important to have an airplane. That said, thanks a lot mate. Nadam se ponovnom odlicnom uspehu ASL da ima opet odlican profit . Osim sto su radnici dobili bolje uslove za rad i druge stvari su znatno profitirale posto ti isti radnici trose plate tako da je to odlicno. Osim toga jos da dodam da ima znatno vise Turista koji dolaze sa Ju i ostalim Aviokompanijama za BEG. Tako da je to ogroman uspeh za sve j ne treba odma kritikovati bez razloga. We missed you, welcome back INN-NS!